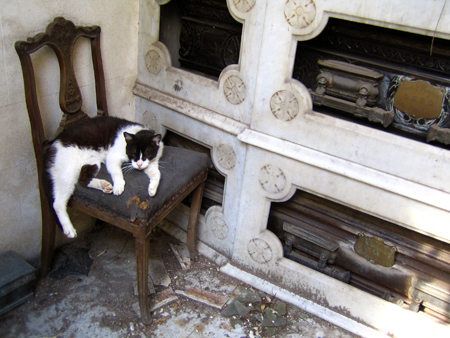 One of the most common—& perhaps surprising—sites at Recoleta Cemetery is the large number of cats that wander around, relax in the sunshine & allow visitors to pet them. In the early morning or around 17:00, women with bags can be seen surrounded by cats who they call by name. These women form part of a volunteer group that feeds the cats, spays or neuters them, & whenever necessary takes them to a local veterinarian. One woman from Recoleta neighborhood coordinates all cat care & does not want her identity revealed “because I am a well-known person.” She says that for the past 12 years she has done this so “the cats are provided for, & above all, so that there are no rats in the cemetery.” The food is prepared in her home & consists of rice with liver or heart, among other preparations. In addition, once per month all cats are inoculated with an anti-flea injection & given any other veterinary care they may need. There are around 40 cats at present, & it is prohibited to take one home. “The police will stop you,” she says. She affirms that all this care “comes out of our own pockets”… although she would be happy to receive donations. See the alert box below for more details. As mentioned, the cat caretakers value their privacy. If any reader would like to make a donation, please leave a comment in this post, & we can put you in contact with the volunteers. Hey Robert, that’s awesome. I’ve always wondered why those cats seem so healthy and well cared for. Now I know. I’m returning to BsAs tomorrow and would be happy to make a donation. Hope everything is going well for you — love the pics and updates, as always. Hey Steve – Good to hear from you. Things are going well… I’m in Esquel until the 25th, then off to Bogotá in a couple & finally living in Lisbon until August-ish. It’s been crazy. Have a good time in Buenos Aires! I’ll have to get the phone number from Marcelo, then I’ll pass it along to you. Saludos! I am in search for my father’s grave site. I was wondering weather or not he is in your cemetery. His name is Zygmunt H. Purzycki. He passed away in 1954 while working in your country. I appreciate all the help you can give me. I was only 7 years old when he passed away and I would like to return to see his grave. Krzystof – The only way to know if he is buried in Recoleta Cemetery is to contact the staff. We are not the official webpage (there is none unfortunately), but they have a Facebook page you can easily find. Good luck!! Hello there! I was wondering if you have any updates on the cat caretakers from the cemetery. I was just there today and it seemed to me that some of the cats are not looking so great. A few where very thin and one (who I see in your blog from 2010) has lost both his ears and looks unwell. Is there still a person who looks after them? Hello Kay – Sorry to take so long to respond… I’m not sure what’s going on with the cats now because I moved from Argentina about a year ago. I’ll get some friends to stop by & see if they can find out anything. Thanks for letting us know! !